Equal volume of aluminum weighs one third as much as steel and as soon as it is produced it oxidizes when it enters in contact with air, thus creating a thin protective layer resistant to water and to some chemical substances. For further information contact: Cantieri Navali di Lavagna; via Dei Devoto 197; 16033 Lavagna (Genoa, Italy); telephone +390185 300341; fax +390185 306601; website: www.cnl.it; e-mail: info@cnladmiral.com. Let us start from here, from the "main" properties of aluminum, that is, from its lightness and from its resistance to atmospheric corrosion for we want to introduce the Admiral 33 starting from her essence. 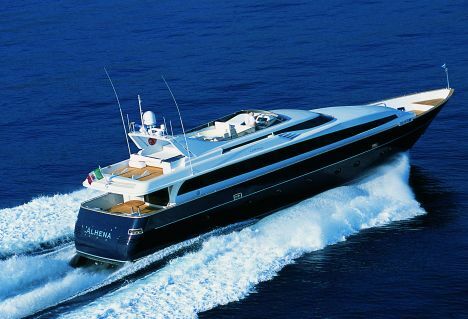 Construction in aluminum alloy - material common to all Admiral megayachts of the Cantieri Navali di Lavagna - leads to other features that highly distinguish the yacht. In fact, thanks to this material the yacht not only weighs less and does not oxidize but its shape and size may be tailored to the Owner's requests. As aluminum is pliable during workmanship, it allows designers to create new aesthetic lines even during the design phase of the hull, offering naval engineers and architects the possibility of interpreting at best the client's needs and tastes. Without the use of molds, every single piece is custom-built creating a complex puzzle, and made to order to fully meet the Owner's requests. Even the construction quality of the Admiral 33 is guaranteed for the shipyard reached such a high level of specialization in aluminum construction that it ensures the highest standards certified by the American Bureau of Shipping: all CNL yachts are classified with Maltese Cross A1 Yachting Service. The Admiral 33 is a fully custom-built, lightweight and fast yacht, with a hull that best interprets the CNL tradition in terms of durability and performance even in rough sea conditions. Her waterlines were designed in collaboration with Bacigalupo Design Studio: a slanted aft deadrise offers good seakeeping abilities in rough seas without reducing performance. The wide beam was a technical choice dictated by the wish for greater comfort. This Admiral was conceived for long cruises or for protracted anchoring in bays. In fact, it is fitted with large fuel and freshwater tanks obtained in the double bottom hull; this solution not only increases the yacht's range but also lowers her center of gravity, offering greater stability. The yacht's cruising qualities may be highlighted by the fact that she is fitted with two 33kW-generators plus a 25 kW one, a water maker, a softener system, a disinfection system and a black water treatment system. 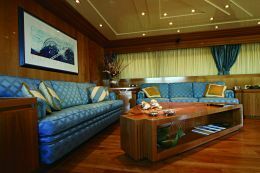 This equipment is in part, the result of the work of Architect Laura Baldoni De Gorga, the interior designer of this thirty-three meter yacht who paid attention even to the smallest details. High- quality woods, such as cherry wood and walnut root and light-hued fabrics were used for bright and classy interiors, in line with the CNL criteria but also, and above all, with the Owner's tastes. He requested four cabins on the lower deck. 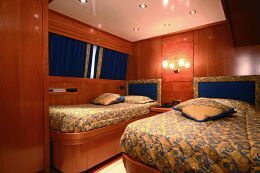 The master and the VIP staterooms are larger and have en suite bathroom, walk-in closet and double bed. The other two cabins have twin beds, hanging lockers and separate bathrooms. 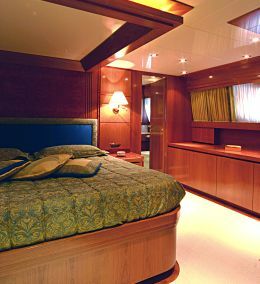 Even the crew quarters are on the lower deck; they are forward and separated from the other cabins for greater privacy. 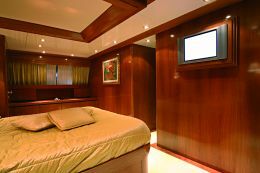 Access to the crew quarters is through the galley, which is forward on the main deck together with the salon and the TV corner. 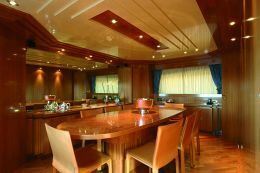 The flying deck is large and includes a living area suitably integrated with the dining room. 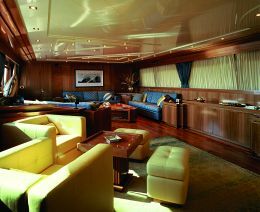 A comfortable sunning area for suntan lovers is fitted on portside aft. A garage for a jet ski and a tender is located on the lower deck aft, while on the main deck forward, there is an additional storing space for another jet ski and a service boat.